Following on from a news item TUW covered several weeks ago (see below) regarding "Prisoner" Music Editor Eric Mival selling his paintings (his talents, as you have seen, extend beyond editing and film-making), TUW is delighted to announce that a further painting of Eric's is now for sale, with all serious offers considered. 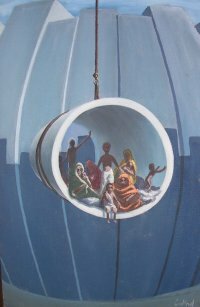 The original painting ("People in the Pipe" left which measures 70x48cm) has a reserve price of £299 (with 10% donated to TUW's event fund for Ty Gobaith Hospice). Offers and enquiries should be made by email HERE. UPDATE: See above for news that Eric has painted a Prisoner-related painting, representing an unused storyline idea that he penned for Patrick McGoohan and David Tomblin back in 1967! With thanks to Eric Mival for this news item.